NEW: All illustrated articles on D.B. Cooper published by Adventure Books now appear on our column at Quora, and we are phasing OUT our WordPress blog. Readers can follow, post content, or comment by signing up at the main Quora website. Quora is the famous question-and-answer website based in Mountain View, CA. That Ken Christiansen of Northwest Airlines was perhaps the hijacker who got away with it. NEW: A 52-page confidential report on the evidence against Kenneth P. Christiansen and his alleged accomplice Bernard Geestman is now complete, and will be submitted to the Seattle FBI in May of 2015. It includes many evidentiary documents and pictures, as well as Christiansen's brother's DNA profile, for comparison to the partial profile the FBI has that was obtained from the tie DB Cooper left on board the aircraft. Possible fingerprints from Christiansen could be discovered on several sheet-protected photo albums that will also be submitted to the Seattle FBI. Any prints gathered from these albums would be used to compare to the 56 or so prints now held by the FBI in the Cooper case. If only ONE of them matches, this will finally solve the case once and for all. 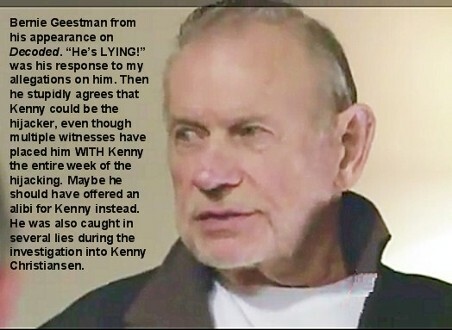 The report also includes much testimony from witnesses, including members of Geestman's own family. It is the final result of an investigation the staff of AB worked on for nearly six years. We have released this confidential report to the public, detailing the basic case and the evidence against both Christiansen and Geestman. The link is on the right side of this page. Right-click on it and select 'Save Target As' for best results. It is in PDF format. All of that said, we cannot claim for certain that Christiansen and Cooper were one and the same, although we think we hit the nail on the head. We leave it to readers to judge for themselves. Before you purchase any book on the famous skyjacker, we urge you to do basic research on the case first. Researchers or reporters can request a PDF copy of Into The Blast free by emailing us at adventurebooksofseattleAT Gmail Dot Com. Please state your credentials if you are with the media and we will gladly send you a copy. NEW: Recently-filmed video (one hour, fifteen minutes) on the evidence against Christiansen and Geestman can be viewed at YouTube HERE. The Dropzone Discussion Thread on the DB Cooper case. Recently re-opened for posts, it has more than a million views, and some of the most famous people investigating the case post there. It contains the single most comprehensive source of information on the Cooper case. Sluggo's D.B. Cooper Research Site - The premier information source on the Cooper case. He is a stickler for avoiding myths and publishing only the known facts. He does not engage in speculation. What he DOES do on his website is to make a huge amount of information available to Cooper researchers. He has all the maps, all the known hard data. If you don't know who D.B. Cooper is right now, you will know after visiting his site. Document from Seattle FBI agent John S. Detlor - He was one of the the original case agents. PDF shows that Earl Cossey, the FBI's go-to guy on chute identifcations...did not actually own or deliver the chutes to SeaTac Airport. In dozens of media articles over the years, he claimed he did. (Cossey was beaten to death in April 2013 in his own garage in his home town of Woodinville, WA. The case is unsolved and most likely does NOT have anything to do with the hijacking.) For details on the Cooper parachutes, and Cossey's true involvement with them, see HERE. Citizen Sleuths Website - Three researchers were allowed full access to some of the physical evidence in the D.B. Cooper case. They are Tom Kaye from the Burke Museum at the University of Washington, University of Chicago scientific illustrator Carol Abraczinskas, and metallurgist Alan Stone, president of Aston Metallurgical Services in Wheeling, IL. They did extensive testing on the famous tie, as well as some of the packets of the ransom money that was discovered in 1980. Their excellent website contains a wealth of information and pictures about their results. Highly recommended. They are definitely on the ball. Skyjack - The Hunt for D.B. Cooper by Geoffrey Gray. Released in August 2011, it is the personal journey of an author who explored the Cooper case and the people who investigate it. Although Gray never comes to a final conclusion on the identity of Cooper, it is still a great book all around. A video produced by Robert Blevins of Adventure Books detailing the most current evidence against Kenny Christiansen and Bernie Geestman in the unsolved 'DB Cooper case can be seen at YouTube HERE. BELOW: Additional information and helpful links related to DB Cooper. Right-click HERE to download in PDF the actual 52-page report that went to the Seattle FBI on suspect Kenny Christiansen in 2015. NEWS: The motion picture rights to the Kenny Christiansen story were optioned to a film production company in Los Angeles in February 2017. The company was provided all public and confidential files on the investigation into Christiansen and his friend (and alleged accomplice) Bernie Geestman.